Today I went straight from work to a car show at Target! 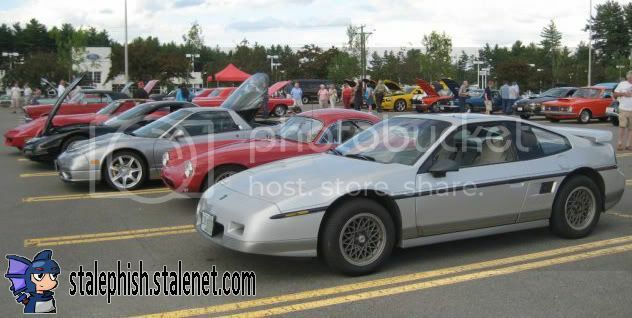 I got there about a half hour early when it was fairly empty and found a good spot to park my 1987 Pontiac Fiero GT. When I first got there I stood around my car and checked for wireless signal; the only two available were encrypted, what luck! I waited around for more people to show up, and then a nice man named Don parked next to me in his 1987 Pontiac Trans Am. Our cars were from the same company and same year, so from a distant glance, they could've been twins. I talked to him for most of the show, he knew alot about my car, as his was so similar, and gave me many sug gestions for working on mine. Within an hour the parking lot had filled up! My mom eventually came by and hung around for a little while. I was surprised at the variety. Someone told me more Fieros were on their way, but they never showed up. At least it was still an awesome experience. There were more Corvettes, Mustangs, and GTOs then I could keep track of. Many of which appeared to be in perfect condition! Nearing the mid-point of the show, a brand new 2008 Dodge Challenger drove by, with its huge 20" wheels and 6.1 litre engine. What a fantastic re-creation of the classic this is; not like the new Mustang with its pseudo-retro look. I plan to make this a weekly visit, and if you're in the area, you should drop by; every Friday 5-9 at the Target in Nashua on Amherst St. Right before I left, they had a raffle for the drivers in the show. They called off about 10 people with the tickets like I had, and almost got me. Mine was 5467 and they called 5465 and 5468. Seriously, is that just bad karma? It was just as cool leaving the show, too. There's nothing like driving down the road with at least half of the cars in your proximity being shiney classics. I was at a red light and the two lanes to my right were full of 70's muscle cars that all took off when the light went green. Simply fantastic. The official count at the show was 225 cars. That's quite alot for a little show in the parking lot of Target!